This offer was emailed to all our Hire Fitness customers. To qualify for this promotion, bookings must be for hire periods of up to 8 weeks to get 20% off your first 4 weeks hire and 12 weeks or longer to get 30% off your first 4 weeks hire. The discount is applied to the first 4 weeks only, of your agreed hire period. The discount code cannot be used retrospectively and cannot be used in conjunction with any other deal, offer, promotion or discount. Rowing machines are excluded from this promotion. There are a limited amount of machines in each category, that apply to this offer and so this promotion is subject to availability. To qualify for this promotion, bookings must be for hire periods of up to 8 weeks to get 20% off your first 4 weeks hire and 12 weeks or longer to get 30% off your first 4 weeks hire. The discount is applied to the first 4 weeks only, of your agreed hire period. The discount code cannot be used retrospectively and cannot be used in conjunction with any other deal, offer, promotion or discount. Rowing machines are excluded from this promotion. There are a limited amount of machines in each category, that apply to this offer and so this promotion is subject to availability. To qualify for this promotion, bookings must be for hire periods of 12 weeks or longer. The 20% discount is applied to the first 4 weeks and also to subsequent monthly payments. The discount code cannot be used retrospectively and cannot be used in conjunction with any other deal, offer, promotion or discount. If your preferred item is not available, you will be offered an equivalent or higher grade machine depending on availability. Delivery charges still apply. This offer was sent by text to all our Hire Fitness customers (in 2 franchise regions). To qualify for this promotion, bookings must be for 12 weeks or longer and from the Home Fitness Equipment Hire category. The 2 weeks free discount is applied to the first 4 weeks only and subsequent payments are taken each month at the full rate. The discount code cannot be used retrospectively and cannot be used in conjunction with any other deal, offer, discount or promotion. The discount code cannot be used against the hire of any other fitness equipment, other than from the Home Fitness Equipment Hire category. If your preferred item is not available, you will be offered an equivalent or higher grade machine depending on availability. Delivery charges still apply. This offer was emailed to all our Hire Fitness customers. To qualify for this promotion, bookings must be for an exercise bike from the Home Fitness Equipment Hire category. Hire periods must be of 12 weeks or longer. The 45% discount is applied to the first 4 weeks only and subsequent payments are taken each month at the full rate. The discount code cannot be used retrospectively and cannot be used in conjunction with any other deal, offer, discount or promotion. The discount code cannot be used against the hire of any other fitness equipment, other than an exercise bike from the Home Fitness Equipment Hire category. If your preferred item is not available, you will be offered an equivalent or higher grade machine depending on availability. Delivery charges still apply. To qualify for this promotion, bookings must be for a period of 12 weeks or longer. This offer is subject to regional availability and Individual franchises are entitled to charge delivery where delivery circumstances are either particularly challenging or the delivery location is a considerable distance from their office. If multiple items are booked, the same hire period must be chosen for each item hired in order to qualify for this offer, otherwise delivery will still be charged. The discount code cannot be used retrospectively and cannot be used in conjunction with any other deal, offer, discount or promotion. If your preferred item is not available, you will be offered an equivalent or higher grade machine depending on availability. Delivery charges still apply. 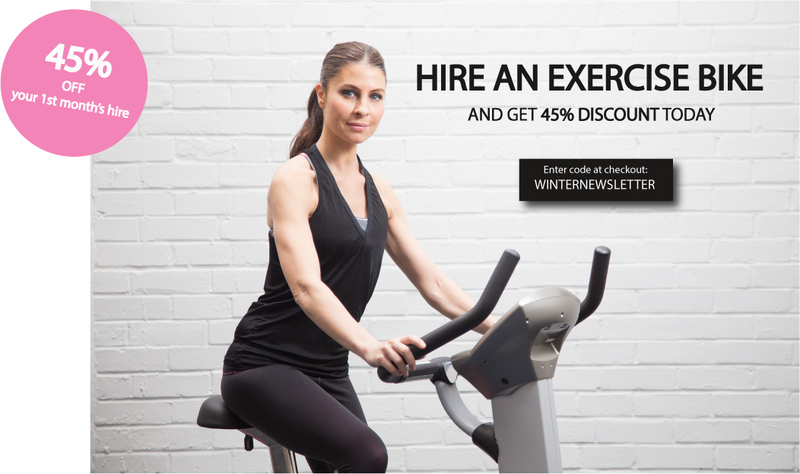 This offer was emailed to all our Hire Fitness customers. 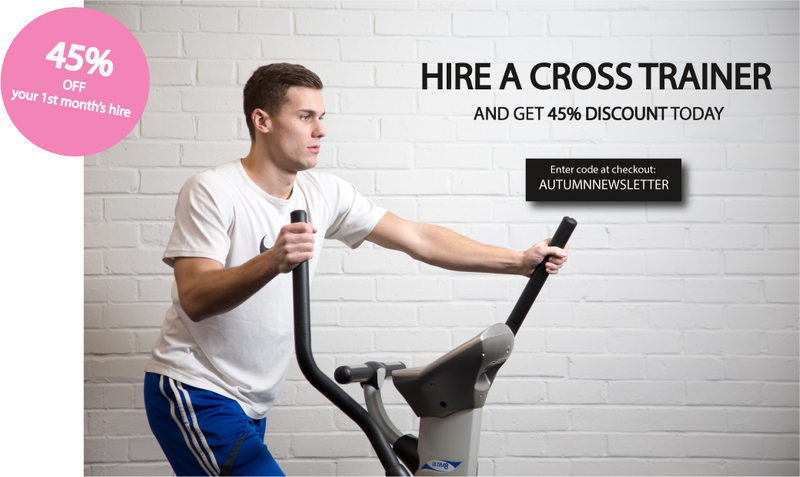 To qualify for this promotion, bookings must be for a cross trainer from the Home Fitness Equipment Hire category. Hire periods must be of 12 weeks or longer. The 45% discount is applied to the first 4 weeks only and subsequent payments are taken each month at the full rate. The discount code cannot be used retrospectively and cannot be used in conjunction with any other deal, offer, discount or promotion. 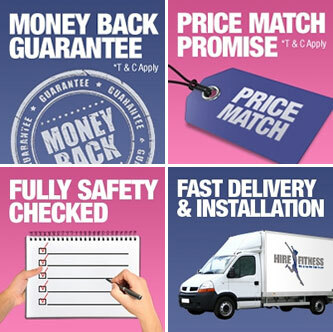 The discount code cannot be used against the hire of any other fitness equipment, other than a cross trainer from the Home Fitness Equipment Hire category. If your preferred item is not available, you will be offered an equivalent or higher grade machine depending on availability. Delivery charges still apply. This promotion was emailed to all our Hire Fitness customers. To qualify for this promotion, bookings must be for hire periods from 8 weeks or longer. The 50% discount is applied to the first 4 weeks only and subsequent payments are taken each month at the full rate. The discount code cannot be used retrospectively and cannot be used in conjunction with any other deal, offer, discount or promotion. If your preferred item is not available, you will be offered an equivalent or higher grade machine depending on availability. Delivery charges still apply. To qualify for this promotion, bookings must be for hire periods of up to 12 weeks but only qualify on hires of 8 or 12 weeks. The 50% discount is applied to the entire hire period up to 12 weeks after which the rate returns to the advertised price. The discount code cannot be used retrospectively and cannot be used in conjunction with any other deal, offer, discount or promotion. If your preferred item is not available, you will be offered an equivalent or higher grade machine depending on availability. Delivery charges still apply. To qualify for this promotion, bookings must be for hire periods of 12 weeks or longer. The 50% discount is applied to the first 4 weeks only and subsequent payments are taken each month at the full rate. The discount code cannot be used retrospectively and cannot be used in conjunction with any other deal, offer, discount or promotion. If your preferred item is not available, you will be offered an equivalent or higher grade machine depending on availability. Delivery charges still apply. To qualify for this £150 cashback offer, bookings must be for hire periods of 52 weeks or longer and all payments must be made on time in order to qualify. 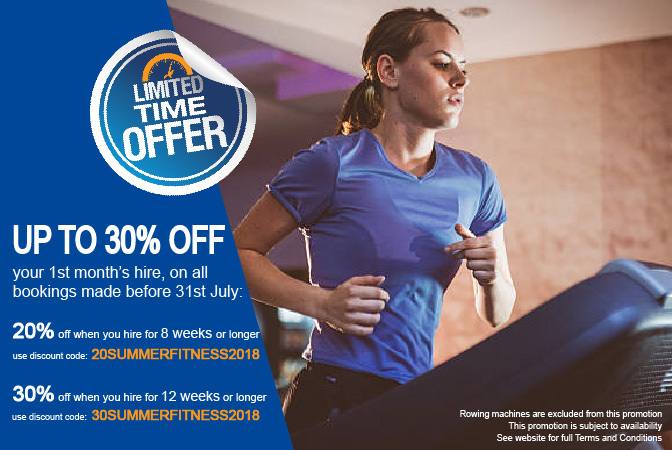 To claim your cashback, you must email cashback@hirefitness.co.uk within 30 days of the completion of your 52 week hire or termination (whichever is longest). This offer cannot be used in conjunction with any other deal, offer, discount or promotion. If your preferred item is not available, you will be offered an equivalent or higher grade machine depending on availability. Delivery charges still apply. To qualify for this promotion, bookings must be for hire periods of 8 weeks or longer. The 50% discount is applied to the first 4 weeks only and subsequent payments are taken each month at the full rate. The discount code cannot be used retrospectively and cannot be used in conjunction with any other deal, offer, discount or promotion. If your preferred item is not available, you will be offered an equivalent or higher grade machine depending on availability. Delivery charges still apply. To qualify for this promotion, bookings must be for hire periods of 12 weeks or longer. The 50% discount is applied to the first 4 weeks only and subsequent payments are taken each month at the full rate. The discount code cannot be used retrospectively and cannot be used in conjunction with any other deal, offer or discount. If your preferred item is not available, you will be offered an equivalent or higher grade machine depending on availability. Delivery charges still apply. To qualify for this promotion, bookings must be for hire periods of 12 weeks or longer. The 50% discount is applied to the first 4 weeks only and subsequent payments are taken each month at the full rate. The discount code cannot be used retrospectively and cannot be used in conjunction with any other deal, offer or discount. If your preferred item is not available, you will be offered an equivalent or higher grade machine depending on availability. Delivery charges still apply. The first 10 customers are eligible for this offer. To qualify for this promotion, bookings must be for hire periods of 8 weeks or longer. The 5% discount is applied to the first 4 weeks only and subsequent payments are taken each month at the full rate. The discount code cannot be used retrospectively and cannot be used in conjunction with any other deal, offer or discount. If your preferred item is not available, you will be offered an equivalent or higher grade machine depending on availability. Delivery charges still apply. To qualify for this promotion, bookings must be for hire periods of 16 weeks or longer. The 2 free weeks discount is applied to the first 4 weeks only and subsequent payments are taken each month at the full rate. The discount code cannot be used retrospectively and cannot be used in conjunction with any other deal, offer or discount. If your preferred item is not available, you will be offered an equivalent or higher grade machine depending on availability. Delivery charges still apply. To qualify for this 50% off promotion, bookings must be made between 23rd July 2015 and and midnight on 2nd September 2015 and hire periods chosen must be 8 weeks or longer. The 50% discount is applied to the first 4 weeks only and subsequent payments are taken each month at the full rate. The discount code cannot be used retrospectively and cannot be used in conjunction with any other deal, offer or discount. If your preferred item is not available, you will be offered an equivalent or higher grade machine depending on availability. To qualify for this 25% off promotion, bookings must be made between 30th April and midnight on 22nd July 2015 and hire periods chosen must be 12 weeks or longer. The discount is applied to the first 4 weeks only. The discount code cannot be used retrospectively and cannot be used in conjunction with any other offer or discount. If your preferred item is not available, you will be offered an equivalent or higher grade machine depending on availability. To qualify for this offer of 50% off, vibration plate bookings must be made between 28th April and midnight on 25th May 2015 and hire periods chosen must be 12 weeks or longer. The discount is applied to the first 4 weeks only. The discount code cannot be used retrospectively and cannot be used in conjunction with any other offer or discount. If your preferred item is not available, you will be offered an equivalent or higher grade machine depending on availability. To qualify for this offer, bookings must be made between 20th March 2015 and midnight on 7th April 2015 and hire periods chosen must be 12 weeks or longer. The discount is applied to the first 4 weeks only. The discount code cannot be used retrospectively and cannot be used in conjunction with any other offer or discount. If your preferred item is not available, you will be offered an equivalent or higher grade machine depending on availability. To qualify for this offer, bookings must be made between 5th February 2015 and midnight on 5th March 2015 and hire periods chosen must be 12 weeks or longer for both the main item and the vibration plate. The offer can only be utilised when put towards the first 4 weeks hire of the vibration plate and cannot be used in conjunction with any other offer or discount and cannot be taken in cash. If your preferred item is not available, you will be offered an equivalent or higher grade machine depending on availability. When using this discount code, your shopping cart will be credited with £85 in total, which includes the £50 discount plus the second delivery charge of £35 which is not required when ordering 2 or more items. To qualify for this offer, bookings must be made between 15th January 2015 and midnight on 31st January 2015 and hire periods chosen must be 12 weeks or longer. The discount code cannot be used retrospectively and cannot be used in conjunction with any other offer or discount. If your preferred item is not available, you will be offered an equivalent or higher grade machine depending on availability. This offer cannot be used when delivery is impeded in particular because of extreme rural conditions or if access is difficult due to stairs and tight corners. In these circumstances additional delivery charges may apply. To qualify for this offer, bookings must be made between 1st January 2015 and midnight on 14th January 2015 and hire periods chosen must be 8 weeks or longer. The discount is applied to the first 4 weeks only. The discount code cannot be used retrospectively and cannot be used in conjunction with any other offer or discount. If your preferred item is not available, you will be offered an equivalent or higher grade machine depending on availability.